Lemongrass has antibacterial, antioxidant, and other therapeutic properties. After a hard day working in the garden, we appreciate lemongrass as a remedy for our aches and pains. 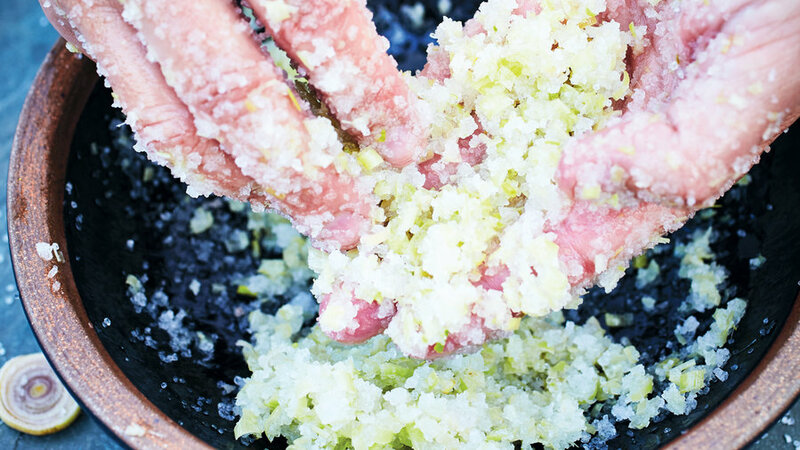 Use this salt scrub on your hands daily or on sore muscles once a week while taking a deep soak in the tub. If you have very sensitive skin, you may want to use the salt scrub only on your hands or substitute brown sugar for the salt as a milder alternative. Finely chop the lemongrass by hand or in a food processor. Combine the chopped lemongrass, salt, and oil in a bowl and mix with a wooden spoon—or even better, use your hands. The texture should be moist enough to hold together but not overly oily. (If it does get too oily, add a pinch more salt.) Scoop the scrub into a 12-to 16-ounce jar and seal with a lid. Use within 2 weeks.